Have you ever seen a craft and thought hmmm… how can I take this craft and incorporate academic skills? Recently I had a few sunflower crafts popping up in my Pinterest feed. And that’s exactly what happened! My brain went into overdrive thinking of all the number and place value possibilities. You can take this one simple sunflower craft and practice or reinforce a variety of skills. These include sequencing numbers; conceptual understanding of teen numbers; counting by 2’s, 5’s, 10’s or any multiple; developing understanding of tens and ones; and showing multiplication as groups of the same quantity. 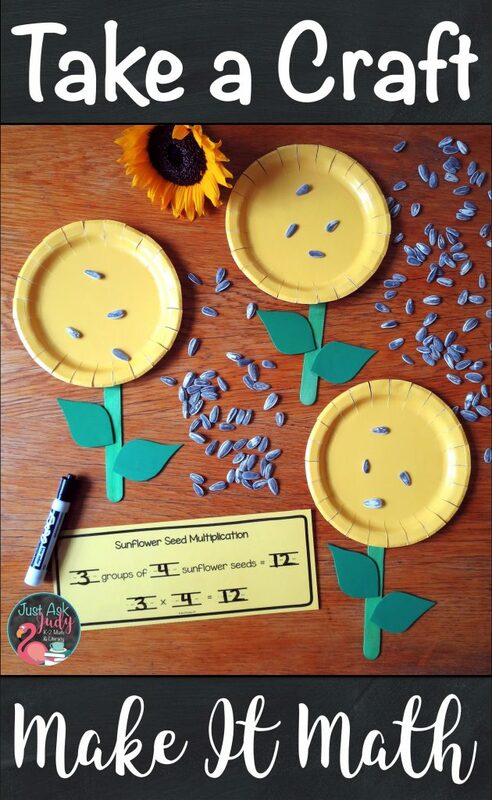 Here is one way to make a sunflower craft for math. The plates I purchased at a dollar store had natural well-spaced ribs around the rim. Cut through these or at (more or less) regular intervals to make petals. Create a leaf template. I used a free graphic, made it an appropriate size, and printed it on cardstock. Then I cut out just the leaves. You can also draw the leaves freehand. Trace the leaves on green foam, cardstock, or construction paper. I made two for each flower. Cut. Glue the leaves to the green popsicle sticks using white glue or glue sticks. Need a simpler idea? Just cut the petals on the plates. That’s it! Find links to similar sunflower crafts at the end of this post. 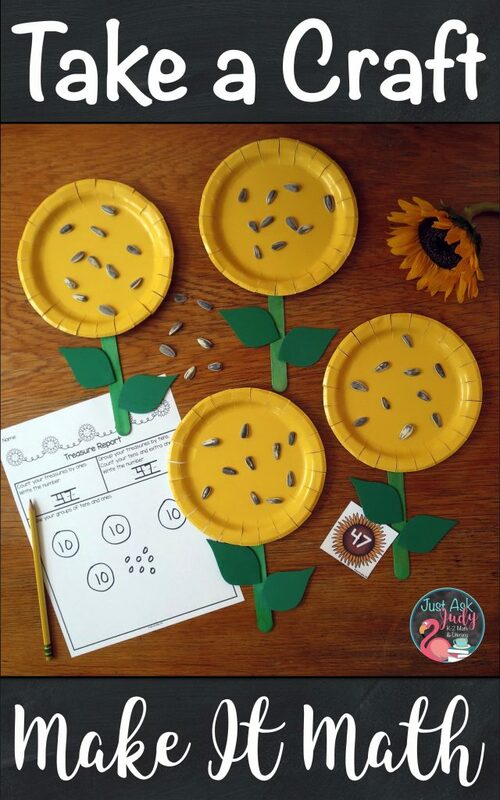 Have your students create one or more sunflowers for morning work or during a center time. This will give you a collection of sunflowers. For most of the activities, you can assign a specific quantity of sunflower seeds for an individual student or groups of students to glue on their flowers. The seeds can also simply be placed, without gluing, on the flowers to provide greater versatility. Students can practice or review numeral recognition, one-to-one correspondence, and sequencing quantities/ numbers. 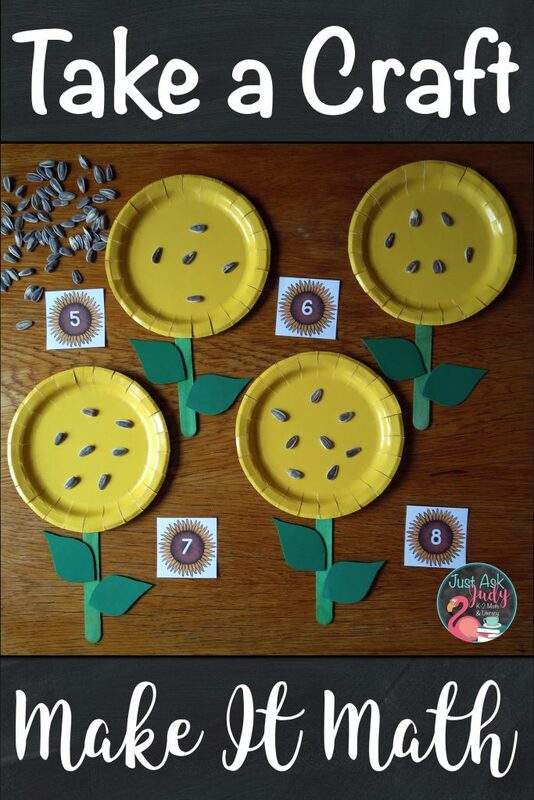 Match the free sunflower number cards to quantities of seeds to reinforce recognition. Here’s an idea. First, have a group of students work together to glue an assigned number of seeds, 1-10, on their flower(s). Next, have them sequence the plates in order. Finally, they can match the numeral cards to the sunflowers. And yes, for this activity (and the count by multiples activity below), I would encourage my students to sequence the plates in a linear fashion. Have students show teen numbers as ten plus a number using their sunflowers. Show the matching equation by using the free 10, +, and = sunflower cards. After taking photos, I decided to add teen number recording strips (10 + _ = _ and 10 and _ more = _) to this resource. Give a group of students a number such as 2, 5, 10, or any multiple. They glue or place the given number of seeds on a set of sunflowers. Let them use the number cards to show how to count by their given number. Find this free resource with a description of the activity along with five different fall themed recording sheets in my TpT store. Check out this blog post, One Lovely Way to Teach Place Value for Understanding, for background information and a link to the same free resource with a Valentine’s Day theme. Provide each student or pair of students with a baggie containing 11-99 sunflower seeds. Students group their seeds by tens, placing each group on a flower. Leftover ones can be placed on their work surface. Choose an appropriate sheet for them to record their results. Students show the same number of sunflower seeds on multiple flowers. Write the number of seeds and groups along with the multiplication equation on the free half-page recording sheet. For fun, let your students randomly choose two appropriate numbers out of a seasonal container. Let everyone know your favorite math “craftivity” to use with your class in the comments below. 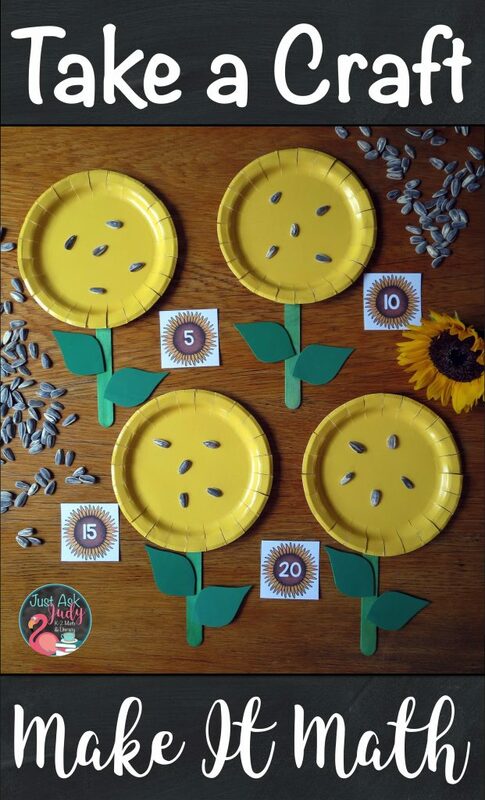 Need more sunflower themed number activities? Check out these two new resources available in my TpT store. 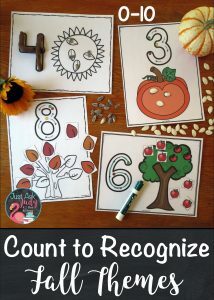 Fall Themes Count to Recognize Number Mats 0 to 10 are perfect for preschool and kindergarten. 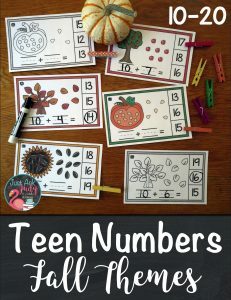 Fall Theme Teen Number Clip Cards are a wonderful addition for kindergarten and early first-grade math. Want the Free Resources in This Post? 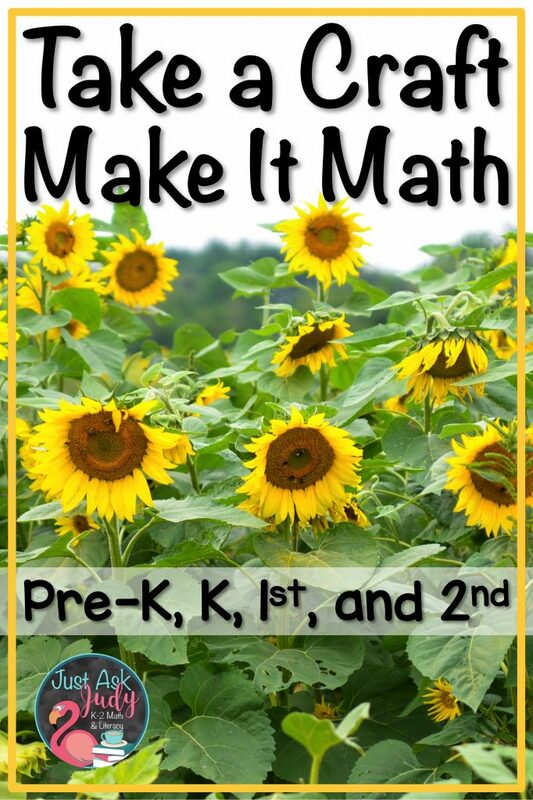 Click on the highlighted words, Sunflower Number Cards and Tens and Ones Fall Theme Treasure Reports, to download these free resources. 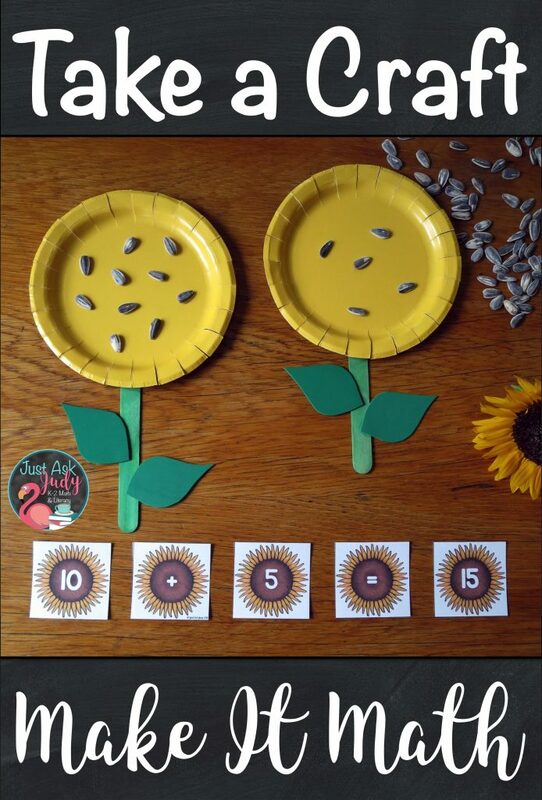 The Sunflower Number Cards resource includes +, =, and extra 10 cards. It also has quarter-page size teen number recording sheets and the half-page multiplication recording sheet.